How to delete a site column in SharePoint online? Go to Site Settings by clicking Site settings gear and then "Site settings" from the menu. Click on "Site Columns" link from Web Designer Galleries group >> Select the site column to delete. Scroll down and click on "Delete" button and confirm the prompt to delete. 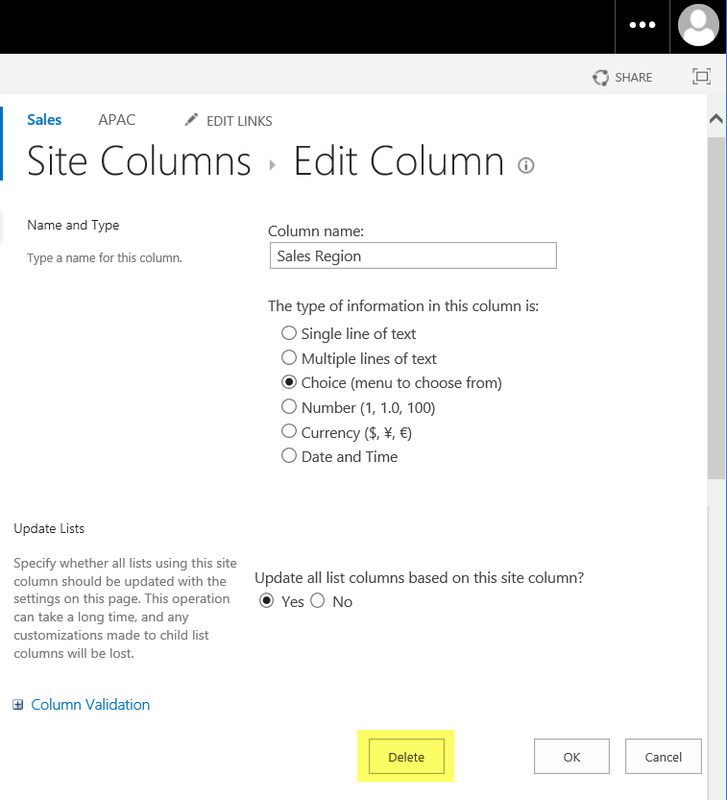 This removes a site column in SharePoint online. When you remove a site column, any list or library which is using the site column doesn't get affected and the data remains safe! Write-host -f Green "Site Column Deleted Successfully!" Write-host -f Yellow "Site Column Doesn't Exists!" Write-host -f Green "Site Columns Deleted Successfully!" Write-host -f Yellow "Site Column Group '$($SiteColumnGroup)' Does not Exist!" Please note, If the site column is a member of any content types, You can't delete until you remove the column from the content type!